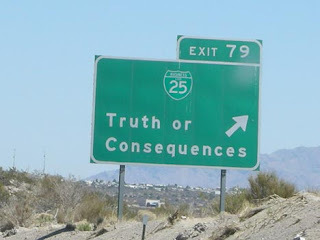 “Truth or Consequences” is an odd phrase. It’s the “or,” that doesn’t seem to fit. Don’t you think the word “and” would fit in better in this phrase? Whether what we say is the “truth,” or not, there are “consequences” either way. What we say does have consequences, and that’s because what we “say” is actually the same thing as what we “do.” Check out the writings of John R. Searle, particularly Making The Social World, if you would like to pursue this point. Human action is inevitably tied to speech. We “say” something in order to make it real. Our actions follow upon our statements, and it is our statements, really, that lead to the “consequences” that eventuate. The human reality we most immediately inhabit, in other words, begins with a declaration. In our world, the “truth” is what we say it is. In the world of Nature, things are different. With respect to the world of Nature, we don’t get to say what the “truth” is, and if we ignore the true realities of the world of Nature, there are real “consequences,” indeed.